BOULDER — A Boulder software company’s risk management product sits front and center for companies in the restoration and recovery industry as Hurricane Florence whips and drowns the Carolinas. then displays real-time information about conditions affecting those assets. It enables property owners to see what is happening with their properties, and permits disaster recovery companies to know what they’ll face when they can get to the property after a storm. Jeff Schott, co-founder and president of Earthvisionz, told BizWest that companies like Belfor Property Restoration use the software. 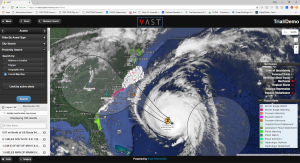 They upload client property information into the software so that their command centers have the best information about properties as well as what is happening to the property during a storm. Schott said the software makes available the latest information from the Federal Emergency Management Agency, National Oceanic and Atmospheric Administration, National Weather Service and others to provide alerts to users of the software — alerts that can be received on any device. “Flooding causes 80 percent of the damage from storms in this country,” Schott said. The software pushes out alerts to warn people of impending disasters. Flood plain data is included. “The magic of the software is marrying the alerts to the assets on the map,” he said. The maps contain information about properties — the number of square feet, the value, the name of the insurance company, the name of the lender if it has a loan on it, the type of construction and more. Before and after images of the property are available so that disaster recovery agencies know what they’re up against when they can return to a property after a storm. In fact, satellite imagery will show damage as it occurs, not just after, said Schott. With hurricanes, the path of the storm as it relates to properties or assets is quickly known. And assets might include pipelines, telecom resources and anything in the storm’s path.